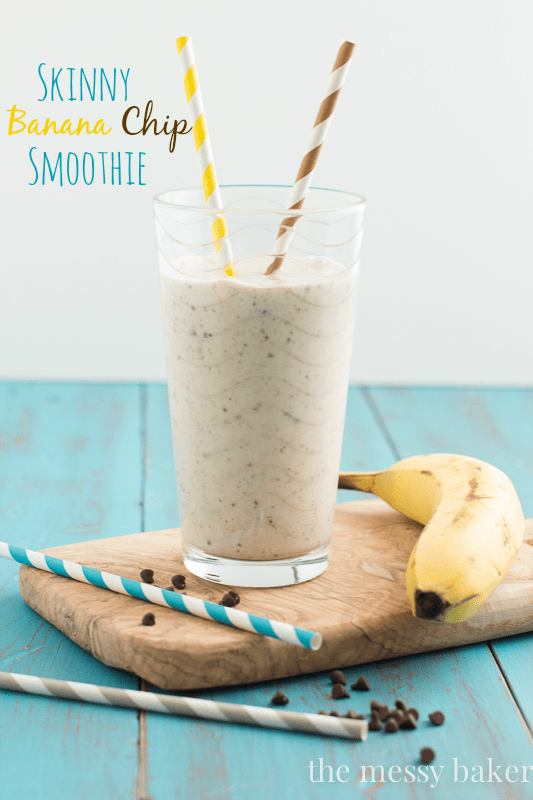 A thick, creamy smoothie made with frozen bananas and mini chocolate chips. Somehow, either by some freak accident or by deliberate effort, January has been crowned the month of change. The word change means something different for every person; however, the most popular form of change during the month of January is the transformation of eating habits. New beginnings usually equates to throwing out old eating habits and starting fresh. Whether that means chewing on lettuce, going on a liquid diet, or eating like a caveman, new habits are put into place while the old habits get thrown in the trash (literally, all the cookies go bye-bye). The word diet scares the sugary sprinkles out of me. Maybe dieting is for some folks, but it’s certainly not for me. When I enlist the word “diet” into my vocabulary, I get all twitchy. The word diet is like a sweater one size too small and cutting into my pits—it’s just not comfortable. When something isn’t comfortable, it’s bound to be discarded. The same thing goes for dieting. As soon as I feel restricted, away it goes. For me, choosing what I eat wisely works better. One cookie instead of five. I scoop of ice cream instead of a five-scoop sundae with the works. A small plate of stuffed jalapenos instead of a platter. I think I you get it. When I’m hungry for a snack or need a quick meal on the go, I lean towards smoothies. Remember the recent banana tutorial I posted? Now it’s time to use your banana freezing skills to whir up one of these super thick, slightly sweet, perfectly creamy skinny banana chip smoothies. The frozen banana creates a smooth velvety base for this smoothie, almost custardy. Add in some vanilla almond milk, slivered almonds, Greek yogurt, and mini chocolate chips, and you have yourself a frozen treat. This smoothie is filling, so you can use it as a meal supplement (say, for breakfast), pre/post workout energy booster, or an after-dinner snack. A healthy and thick smoothie made with ripe frozen bananas, creamy Greek yogurt, mini chocolate chips, and honey. Add banana, yogurt, slivered almonds, honey, and almond milk to the bowl of your blender. Pulse until smooth. If the mixture is too thick, drizzle in a bit more milk and pulse until fully incorporated. Add the mini chocolate chips and pulse until smooth and the chips turn into flecks. My thoughts exactly: ” The word diet is like a sweater one size too small and cutting into my pits—it’s just not comfortable. When something isn’t comfortable, it’s bound to be discarded.” YES. Diets are not for me either! I love this smoothie – it’s the perfect breakfast! You said it, girl! The word is “choose”. It’s empowering vs. restricting. Saying, “I’m not eating that, but choose this” or “I’m only going to have a small portion of what I want” is all-empowering. So much better on the psyche. LOVE this recipe! I totally agree with you, Stacy. Thanks! I totally agree about diets…I will never be able to give up ice cream, and see no reason to..I just don’t eat a whole tub of it haha! I often make a similar smoothie to this but use cocoa powder instead of chocolate chips…I love the idea of the chocolate chips though, I’ll have to toss some in next time! Exactly, Lily. I love the addition of cocoa powder. Thanks for stopping by! Love how you talked about a diet feeling like a one size too small sweater! Totally agree. Eat healthy 80% of the time and live it up the other 20% of the time. The world would be a sad place without cookies. I love this smoothie idea! I actually tried using frozen bananas as a smoothie base, and hate how ice cubes water down so fast! Need to try this! I couldn’t agree more, Taylor. Thanks for stopping by! Mmmm I LOOVE this smoothie! So creamy and delish. Hooray for bananas! Frozen banana smoothies are the best! Love this twist! Ooh, it looks like a milkshake! I can pretend it is one, right? :D This looks amazing! Pretend away, Kiersten. Your mouth will never know the difference. Thanks! Love the addition of the chocolate chips!!! Chocolate and banana is one of my favorite combos! Great smoothie! Poor, unloved cookies. I didn’t actually throw any cookies out (I’m weak), but I know a ton of people who clean house on January 1st to avoid temptation. Thanks, Erin! I’m with you – as long as I call it eating sensibly, I’m fine. But as soon as I call it a diet, it’s all over! I want to blend alllll the bananas and alllll the chocolates! :) This smoothie looks amazing and definitely a wise choice for keeping life healthy yet delicious. I’m not a fan of the word “diet” either…it kinda makes me shudder. bllleeeeeh! Cheers to making wise food decisions and enjoying the things we put in our bodies! As soon as I hear the word diet, Julia, I want to rebel. I need to play a bit of reverse psychology on my brain and fake it out with smoothies such as this one. Thanks! Poor unloved cookies. They can find a good home in my tummy. This smoothie sounds super yummy and decadent. Who even cares that it’s healthy! My thoughts exactly, Kim. I didn’t throw any cookies out, but I know a ton of people that clean house on January 1st. It’s like you’re faking yourself out with a smoothie. It tastes like ice cream, but it’s oh so good for you. Love this smoothie, Jennie. I make a version with some rolled oats in it too for extra fiber. I just love how frozen bananas transform into a custardy texture when blended. And you are so right, diets just make life one big (or small) itchy sweater! Thanks, Mallory! I love adding rolled oats to my smoothies–extra fiber, thick smoothie.